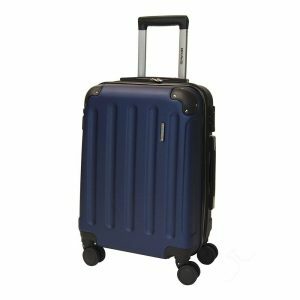 Performa by Xena released the modern compact 21-inch expandable hard shell cabin luggage by mid-2018 as part of the Bravo collection and it first appeared on Amazon.com in July, 2018. You can also get this Performa luggage design as part of a set of 21”, 25” and 29” suitcases. You have a total of 8 beautiful colors to choose from for the cabin bag and thanks to their relatively unique design and bright colors you’ll be able to pick your bag easier in an airport terminal crowd. These colors include the standard black, navy blue, silver, orange, neon green, red and purple. And you have 8 more colors for the set, including black, blue, orange, red, purple, silver, champagne and red. There are 9 customer reviews and ratings on the day of this review and the average score is 5 out of 5 stars. The 21” carry-on bag weighs 6.5 pounds with the dimensions of 21 x 14.5 x 8.5 inches. You can fit quite a bit in them- enough for 2-3 days of travel and meets the restrictions set out by the most local and global airlines. These hardshell bags can be expanded by up to 1.5 inches, and thanks to the lightweight and sturdy ABS material used it will let you pack in more without exceeding the weight limit. The medium 25” luggage weighs 8 pounds with the dimensions of 25 x 17 x 10 inches and the large 29” suitcase is 29 x 19 x 11 inches with the weight of 10.6 pounds. They have a TSA lock that ensures better security for the contents of your luggage. And only the TSA staff at the airport can get in without breaking the lock on the luggage. You’ll find the tie-down cross straps inside to keep your clothes in place and center divider with zipped pockets. They all have the quad 360-degree spinner wheels that roll very smoothly. They are easy to maneuver and the corners and other bits have the reinforced protection. You can move them easily by holding the ergonomic push button locking aluminum trolley telescoping handle. They also have the comfy and ergonomic side and top handles to give you a bit more flexibility. 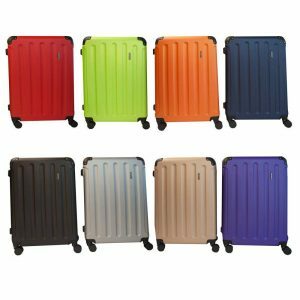 These are functional, user-friendly, sleek, modern, well designed, sturdy and durable suitcases for those that travel often for leisure and work purposes. You can push these suitcases beside you or pull them behind you with their gliding wheels. The limited lifetime warranty offered on these bags is great for having a peace of mind. You can trust them as they are designed for tougher travel conditions. You can expect many years of use on your frequent trips with their solid handles, good quality zippers and exteriors that are resistant to impact.